We just got in these gorgeous blue striped dresses. Very playful dress with a full skirt, backless panel and tie up bow to complete the look. Team it with bold solid coloured accessories to make a statement. aw I love the dress! The pattern is very amazing. The dress is amaze! I will check out your shop immediately. 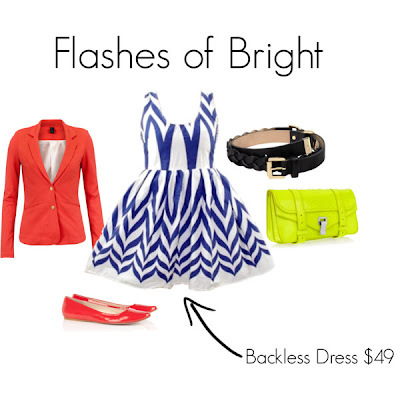 That zigzag dress is the cutest, and $49 is such a good price too! the dress is gorgeous! I love its shape and zig zag pattern. I've just started following you too. The quote by William A Ward in the previous post is definitely something I need to keep in mind all the time!! As for the blush, I used Shu Uemura 'P Orange 55' - I'm not sure if it's still available though. :( I use it every day; it's just the perfect peachy shade for my skin tone I think! I love your blog too by the way! I will definitely have a look at your eBay store - that dress is super cute! Following you on Bloglovin' now! Zukoh is an online store dedicated to bringing chic and classic pieces. This blog is our way of showing you what we've got planned, well as what inspires us and how we style Zukoh clothing!